otherwise 100% original with engine never removed. She's a heavy girl and would benefit from more HP. Whats the best way to achieve this? Lower compression and turbo (has a turbo tail and g50 transmission)? She runs seemingly perfect but apparently not so. While apart will upgrade rod bolts (not splitting the case), chains, rails, sprockets, etc. Any real world advice appreciated. Check out my story in this thread. What led to the leak down test? What were the symptoms? Where is it leaking? Exhaust valve? BTW, Wayne's book "How to rebuild and modify Porche 911 engines" will answer most of your questions on upgrades. Lots of upgrade threads here. Take some time to do some searching. Last edited by Trackrash; 03-09-2019 at 07:49 PM.. Worn valve guides is a common issue on the 3.2. Mine had severe carbon build up in the combustion chamber. Valve seal was poor. New valve guides, valves, and rings gave great results. Having Nikasil versus Alusil cylinders helped as far as rings seating. Compression tests after rebuild were slightly over 185lbs. I was happy with the horsepower after break in, had it in a 1973, so no advice for that question. Want to get more hp out of it. Not just fix it. Shop said ir was a worn valve guide. I had a 2.4 e i rebuilt so confident i can do this one. At least disassemble and reassemble. So whats the best mod. Would like to keep ecu and sw chip if possible. Will 3.4 and 9.5 cr work. Recommended ? Never ceases to amaze me when people are not hesitant to put thousands into hardware but are hesitant to put hundreds into modern engine management The difference is huge, not just power but in smoothness of traffic driving and at the same time throttle response when you need it. Plus it allows you to get rid of restrictive barn-door AFM. With the cost of Webers, I totally agree. Not to mention the antiquated FI systems on some of our cars are begging for an upgrade. One problem is in this over regulated state where I live you are stuck with outdated technology on '75 and newer cars. In addition ITBs and EFI are not exactly plug and play. Whats wrong with Motronics and a modern fuel map and timing of a new steve wong chip? It still relies on old slow-responding and restrictive barn door AFM, no real throttle sensor (only idle/wot switch which really hurts throttle response) and very basic tables to sa the least..
Plus the inability to control modern injectors unless some hardware modifications are done. But as I said, to each thier own. There is nothing wrong if you are happy to accept some compromises. I’ve been happy to in the past but I reckon with ready access to better and cheaper technology I think its time to reconsider the well worn path of "muffler and chip" for C3.2’s. The critical pieces, like the rest of the car, is at least 30 years old so it’s tired as well as superseded technology. Why have a worn and restrictive Air Flow Meter (AFM) when we don’t have to? Does any manufacturers use pintel nozzle fuel injectors any more? How’s your ignition system? Still like new? The vast majority of chip only tunes are a generic tune that have been developed over time to best suit most cars. However since we all use different fuels, with variations in AFM, fuel pressures, injectors and other tolerances at play, this leads to these generic chips having to be a compromise on the safe side and only in extreme luck, an optimal tune. That’s OK and they have served us well when the alternative was unaffordable but times have changed and I think we have ready access to better ways. If the AFM needs to remain to pass the visual emissions check, just hollow it out. Swap out the Motronic with a modern ECU that we can easily tune to the specific vehicle in which it is installed and we can simply retune if we modify the engine further. Use a harness adaptor to connect the new ECU to the existing valuable car harness. Chunk those old injectors away and replace with modern 4 or 6 hole plate design injectors. Go from batch fire of all six injector by simply adding a cam position sensor and a supplementary harness to the new ECU allowing full sequential injection. Want to get rid of that pesky distributor and plug leads? Easy to go to direct fire ignition. Want to chuck that iconic looking 3.2 intake manifold and go ITB like the cool kids? Easy. Want to change the cams to something a bit warmer than 993SS spec? Easy too. I agree with Peeps, I think us C3.2 owners need to think a bit more broadly. The barn door air flow meter (AFM) is not restrictive. This is just a myth perpetuated over and over by those who assume, and those who sell them. The restriction is not the AFM, but the filter airbox. Cutting open the cover or changing to a ported cone air setup eliminates any restriction. Over the years, before and after dyno tests by those who have changed to a MAF sensor have shown no HP or torque improvement over the stock AFM setup. The real gain comes from their replacement of the stock airbox to a cone air filter setup, and different chip software. That is why you will never find a before and after dyno test of just the sensor replacement that proves a gain - because there isn't any. A few years ago I also did extensive dyno testing going back and forth between a AFM vs MAF setup, A-B-A-B-A-B, and there was not even a 1 hp difference at full throttle at 7000 rpm. The setups compared was the stock AFM with a ported MSDS cone air filter setup, vs a Bosch HFM5 sensor (as used in the E46 M3) on a carbon fiber tapered velocity stack with a 90mm diameter opening and a 180 degree radius edge bell mouth, tapering down to the 75mm intake boot. You could say the MAF tube profile is superior to standard 75mm straight tube setup you see guys trying to sell. On each run, the ignition timing was kept the same for each sensor, just fuel map was adjusted to achieve the same optimum AFRs. So I repeat, there is not even a 1 hp difference between the two, and why Porsche continued to use the same sensor for the 964 - for which the same story repeats itself by those who assume the stock AFM is a restriction over a MAF - so guys replace it with kits from FVD, Autothority, Vitesse, etc, only to have all kinds of other running problems and issues that they suffer with as a result of these poorly developed setups. So save your money, and put it where it makes a difference. Pick your budget and decide how far you want to go. If you want to keep it simple, either just rebuild back to stock, or maybe a cam upgrade. If you wanted to go P/Cs, then you can go to a 3.4, where you can send your cylinders to EBS to be rebored and replated for about $1000, and get a set of Mahle 98mm 9.8 CR pistons for them for I think about $2k, netting a 3.4. Or you can get 98mm CP pistons from EBS for I think about $1k. For a street car, I'd stick with the stock heat exchangers, keep the cat or go with a premuffler, and keep the stock muffler, or if you want, you can change to some sport muffler. There is not a lot of hp difference if you go to aftermarket headers and sport muffler, and definitely don't put on SSIs as that will reverse all your power gains back to a unmodified 3.2. I am not selling any MAF product, but standalone ECU which uses either speed density, Alhpa-N or hybrid load strategy all of which are used with closed-loop wideband lambda. 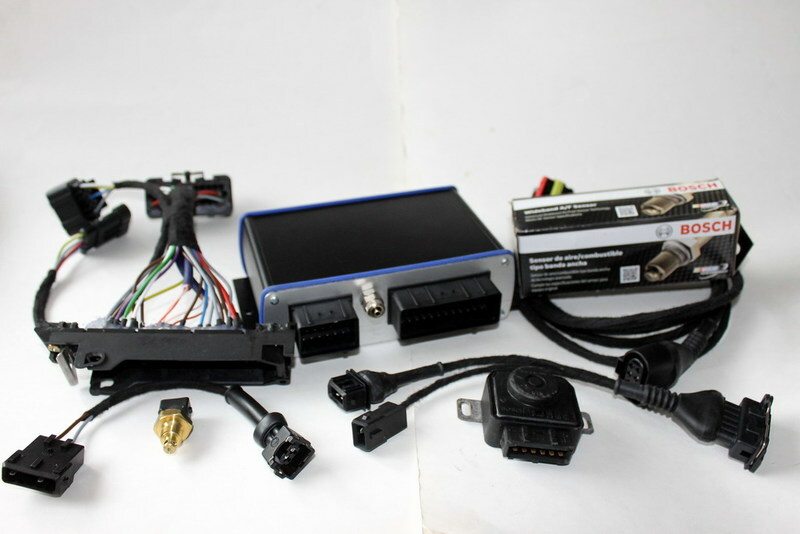 I have installed many VEMS systems onto Porsches and tune as you like, it is not possible to get the same smoothness and throttle response from Motronic compared to nicely tuned modern ECU. Let alone with standalone you can easily go with ITB's and have perfect driveability with those also. No running issues. Thanks for the input. That is exactly what it says in the 911 handbook. If I go to 3.4 at 9.8 cr will my existing Motronics injection and SW chip be up for it or are other mods needed? I added your chip about 6 months ago (91 octane version). My car has Fabspeed cat bypass and 2 out muffler. Any idea what the HP difference will be? Engine is completely stock otherwise (KN air filter). I assume if I keep the cams the same I can keep the chip / intake the same. Or will it need more gas to accommodate the larger displacement (updated chip)? I can't recall what the differences where in terms of config between Steve's map for my 3.2, and a live remap. I think timing was wound back a little on the latter. There was only 5-8 bhp improvement with the live map over the SW chip which was for a 3.2. I don't recall the torque difference. Chris, you can start and break in a 3.4 motor with your chip, but really, because the motor is 5% larger displacement, the fuel maps need to be adjusted accordingly, and as the compression ratio becomes higher, where a stock 3.2 actual compression is in the low 9s, the 3.4s such as from Mahle are at 9.8, so the ignition timing assuming the use of the same fuel octane needs would need to be adjusted down accordingly. This will help ensure optimum power from the engine build, and maximize the engine life and reliability. HP wise, if built correctly typically measures around 237-238 at the rear wheels on a Dynojet, or assuming a 12% transmission loss, is about a true 270 hp at the motor. Sometimes we see 3.4s nearing high 240s with happier cams running 93 oct. Not too long ago I had a unique case where I dyno tuned a fresh built single plug Mahle 3.4 with 964 cams with a premuffler at 237 at the wheels, and for the heck of it, two years later the same owner had the same shop rebuild it as a twin plug 10.5 CR 3.4, added my larger throttle body, changed the cam up one level, for which I retuned and dyno'd out at 254 to the rear wheels. And these are all on stock heat exchangers, running on crappy California 91 octane for which the ignition timing needs to be kept conservative. In race trim, I have 3.4s running close to 280 hp at the rear wheels on Dynojets, or about 320 hp at the motor. This would be with some trick headers, open exhaust, race fuel, single plug, with the stock air flow meter and a ported MSDS cone air filter. 93 octane is readily available here in va. Burned a piston on a 2.4 running too much compression, to lean and to hot. Dont want to do that again. Good to hear the motronics will just need a chip to provide the extra fuel associated with more displacement.